In one such search for a new Body Mist or a Body Splash, I stumbled on this Wottagirl Body Splash! The Variant I have is "Secret Crush".. So here is the Product Information and what I feel about it. 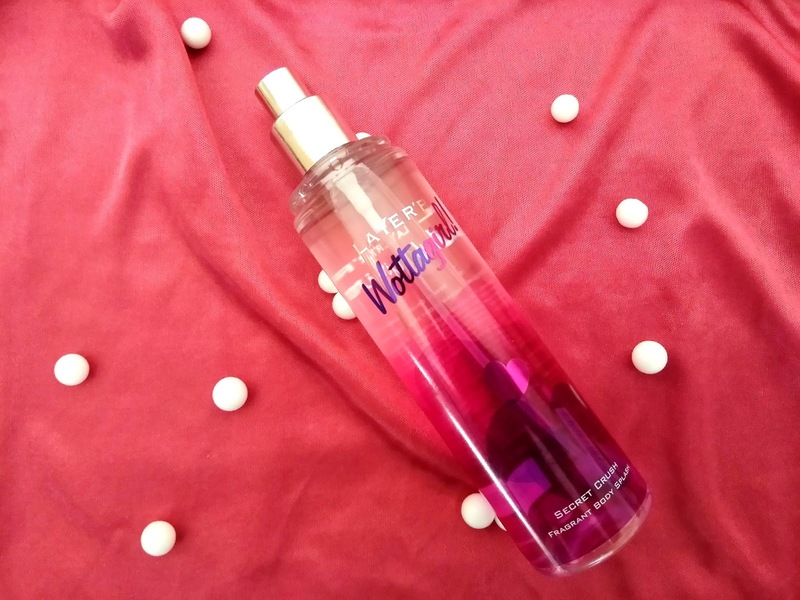 Brand Claims: The sweet, saccharine essence of Secret Crush, the Scentastic, captivating aroma of Mystic Island or the delicious, irresistible fragrance of Vanilla Twist: what are you going to wear today?Layerr brings you Wottagirl fragrant Body splashes: fragrances that will leave you feeling fresh and smelling beautiful. Firstly I love the word " Body Splash". The word itself indicates freshness and a lighter version of typical perfume. It is something which is meant for a daily use. The one I picked up is the Secret Crush! It is a 100% fruity fragrance. 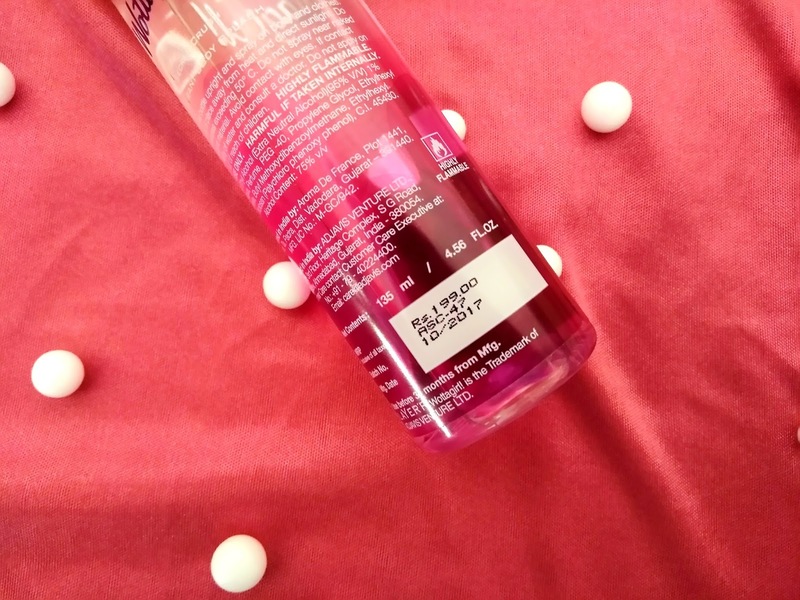 Talking about the packaging first, the first time i saw i thought it is a glass bottle, but actually it is a plastic bottle with Pink and Purple hearts made on it. It is a beautiful and girly packaging. Also, the quality of the plastic bottle is quite good and sturdy. It is safe for travelling since the Cap closure is quite tight and spill proof. So, even if the bottle is made up of Plastic, it is absolute good quality. Coming back to how it smells and the staying power...It smells like bowl of sweet fruits...But in a good way! :) It is a typically sweet scent. If you love fruity fragrances, then you will no doubt love it and if you are someone with a sensitive nose, who like really mild fragrance you will probably find it little too strong for your liking.. I being a lover of Fruity & Floral fragrances loved it!! The first note I could recognize was Pineapple, Oranges... It is a fruity scent but not one of those irritating sweet fragrance to give headaches. Staying power is quite good of this variant, since it is little bit more strong as compared to some of its other very mild variants. For me it lasted for 5-6 hours. Body Mists & Splashes like this are generally from Expensive International brands, So this one is really good option! They have many different variants to suit everyone's taste. I am sure you can also get your perfect choice. 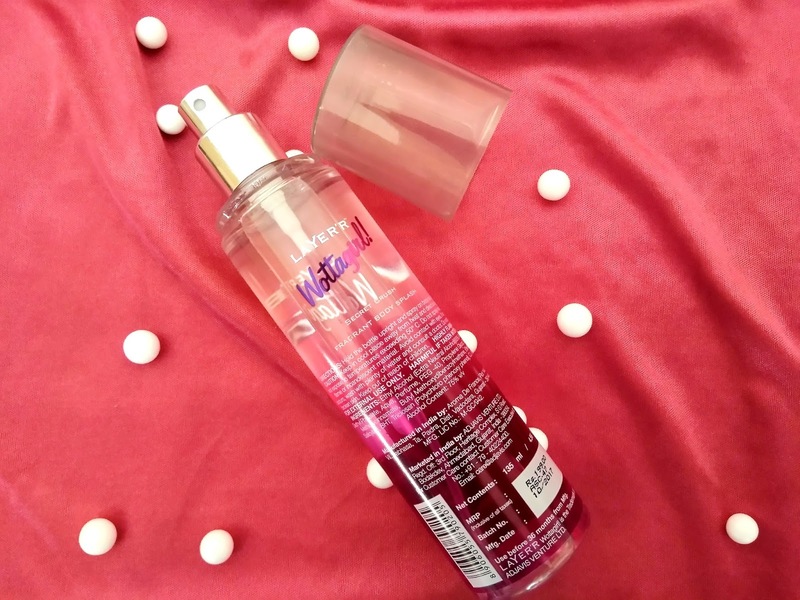 As for this- "Secret Crush", you will like only if you like sweet fragrances otherwise I would suggest you to skip this one and go for some other Wottagirl Variant. I would highly recommend Wottagirl Body splashes...Total worth the money! Perfect if you want to skip those heavy duty perfumes and want to go for more mild and wearable fragrance. I actually cannot wait to try other ones!! Pick one for yourself, I am sure you will also love them..
Till my next post, Keeping Smiling!